Jimmy Buffet had a great song entitled “Changes in latitudes, changes in attitudes” and that is the theme of our post today. Market sentiment often shifts several months (or longer) prior to any price correction and most individuals may not see the shift until long after a cycle turns. During the last housing crisis, most real estate professionals didn’t want to acknowledge the downturn until we were 2-3 years into it. Since that time stocks, bonds, collectibles and real estate have experienced a bull run thanks to the invisible hand of the Fed. After eight years of crisis level interest rates and the reflation of all asset classes, will the cycle finally turn? Let’s run through some charts and data and maybe we will see where this market is headed. 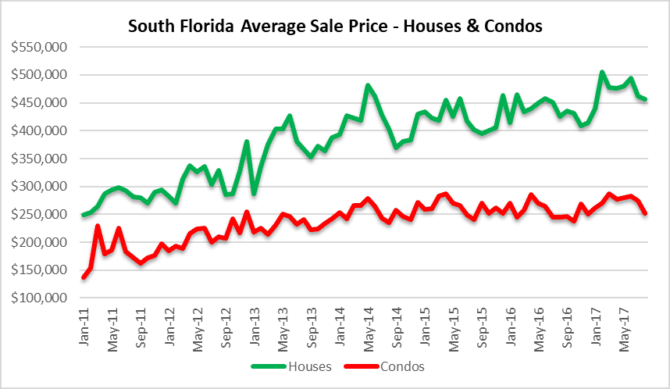 Prices appear to be trending lower in the South Florida single-family and condo markets. Don’t tell the perma-bull real estate agents who are constantly touting residential properties as an “investment”, but this cycle may finally be turning. The chart illustrates the 5% price decline in single-family homes and 10% decline in condo prices from May through August. Everyone has been ignoring this issue for the past several years. Look at the dotted blue trend line in the above chart. 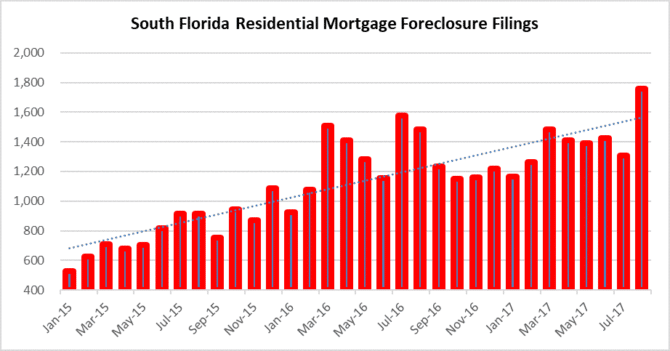 If you just look at the whopping 34% jump in new foreclosure filings from July to August, that is disturbing. 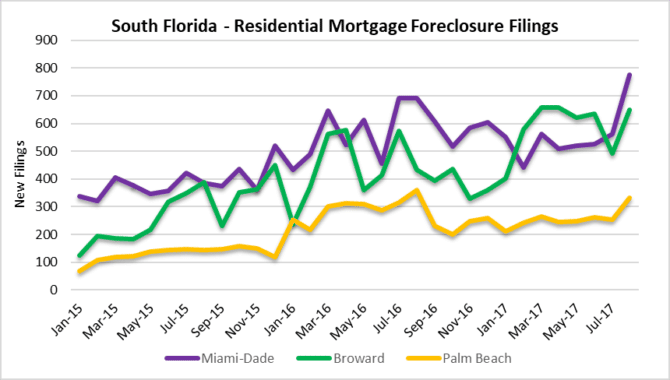 One month doesn’t make a trend, and this chart shows how the pace of new foreclosure filings in South Florida has been climbing steadily over the past few years. The next chart shows how Miami-Dade County is getting active again and new filings are reaching levels that haven’t been seen in years. The chart above is self-explanatory. 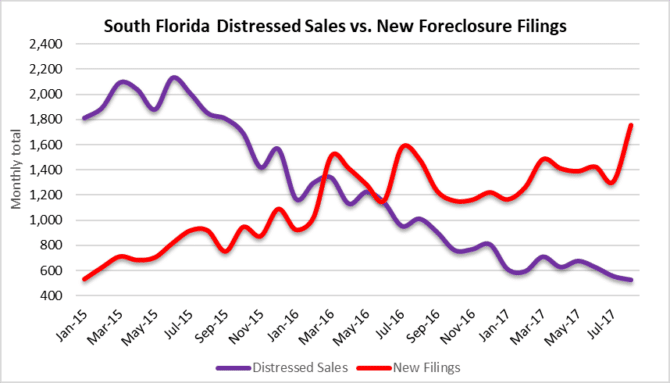 Distressed sales have declined while the pace of new foreclosure filings continues to climb. This trend should continue as lenders now have a green light to pursue delinquent borrowers after years of litigation. 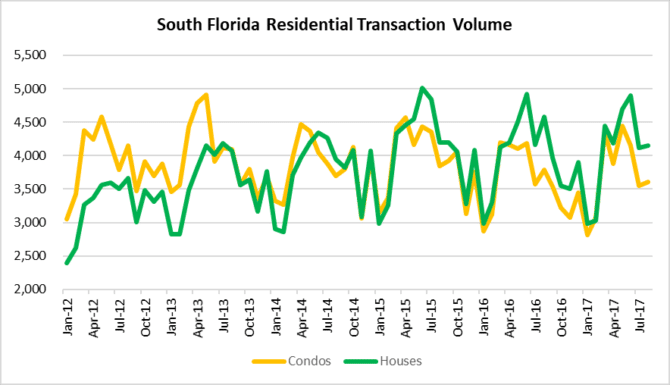 Transaction volume year over year in South Florida has actually increased. In 2016 the monthly average was 7,581 closings per month and so far in 2017 the monthly average is up 3% to 7,799 closings per month when you combine the single-family and condo deals. There has been some seasonal volatility and it will take a few more months to determine whether a slower sales pace will be the new normal. Rates have been favorable for real estate for obvious reasons. After the Fed dropped rates to crisis lows in 2009, they have had a difficult time climbing higher. 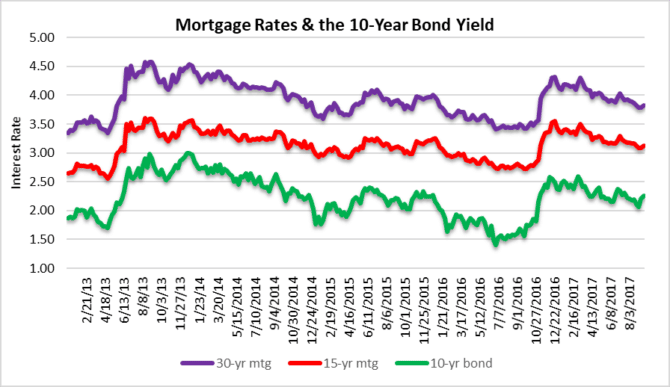 If rates begin to riseat the same time the real estate market cools, that could present some serious challenges. The Fed will start to shrink their $4.5 trillion balance sheet of Treasuries and mortgage-backed securities next month. That will be at a gradual pace, but private investors may demand higher yields in the mortgage space and that will prove more costly for borrowers. There are a number of factors at work in the South Florida real estate market. If you plan to buy or sell real estate in Fort Lauderdale, Miami, or Palm Beach you should be aware of the factors that will steer this market through the remainder of 2017 and next year. There may not be a full correction or “crash” in real estate prices, it may be challenging for prices to remain at current levels for much longer. This entry was posted in Foreclosure activity, Fort Lauderdale foreclosures, Market Insight, Miami foreclosures, Palm Beach foreclosures, South Florida Real Estate and tagged Florida REO, Fort Lauderdale real estate, housing bubble, Miami condo market, Miami real estate, South Florida real estate. Bookmark the permalink. Trackbacks are closed, but you can post a comment.